ExpanDrive is a fast Amazon S3 client that lets you browse S3 (or S3-compatible) storage. It builds native access to S3 directly into Finder and your Mac system at the filesystem level. Finder and Explorer, or any other application, can browser you S3 buckets natively and access the remote content on-demand. It effectively turns your Mac or Windows machine into a S3 Browser. This lets you browse S3 storage without needing to sync down any of the data in advance. You can view buckets, manage files, and transfer large amounts of data from within any application. Files are uploaded in the background with our multi-threaded transfer engine. This makes uploads feel instant and doesn’t leave you waiting on transfers while you continue to go about your work. Most consumer-focused cloud storage services like Dropbox or Google Drive come with their own desktop sync client. S3 is different in this respect. It is primarily accessed by an API, for which you need a client like ExpanDrive in order to take advantage of on your desktop. Amazon provides a fairly basic web interface, but other than that the only way to get data in and out of it is via the API. There are a wide variety of clients to access S3, like S3 Browser or Transmit for the Mac. DragonDisk used to be targeted on this use-case but development ceased a few years ago. Most of these provide basic access to S3, but don’t provide native access to content. ExpanDrive provides advanced functionality and also turns S3 into an infinite-capacity external drive. To get started you load ExpanDrive and input your access key ID as well as your secret key. Connecting mounts the root of your AWS account. Now you can use Finder or Explorer to browse your buckets and then drill into them. S3 is organized into buckets, which are top-level folders that are uniquely named throughout the service. You can attach various policies to a bucket such as restricting access to particular users or making hosted content available to the public. ExpanDrive lets you mount the root of your S3 account, showing you all your buckets (if your user has permission to list buckets). You can restrict mount a specific bucket, or even a particular folder in a bucket, by typing the bucket name in the remote path section. For additional details you can check out our documentation on connecting to S3. This is useful if you have an IAM user with access to only a single bucket or doesn’t have the permissions to list the buckets for an account. Amazon provides a simple guide to get started with their S3 service. ExpanDrive is also compatible with any S3-protocol compatible service like Wasabi or Dream Objects. For Wasabi you modify the server section to https://s3.wasabisys.com and use the Access Key and Secret Key you got from the Wasabi control panel. Click Save or Connect and you’re good to go. Amazon S3 will now be visible as a network drive whenever you login to your computer – letting you access all of your content from Finder, Explorer, Photoshop, Microsoft Office – whatever! Drag and drop files to copy them out to the cloud. You can even stream media content like movies and music directly from the S3 storage without needing to first download or sync them. For more information, check our documentation page on connecting ExpanDrive to S3. Google Drive is the file storage area for GSuite. It comes with 15GB of free online storage and the extended storage plans have huge amounts of capacity. The primary means of accessing Google Drive is via https://drive.google.com in your web browser. For native integration options you can utilize one of Google’s first party apps such as their iOS/Android App or their backup and sync client. If you want to build full native access into your Mac, Windows or Linux machine using a solution like ExpanDrive is a great option. It turns Google Drive into a fast network drive making contents from your drive as well as any team drive available from within any app on your machine. Another nice thing about connecting to Google Drive as a network drive is that you can connect to multiple Google Drive accounts at the same time. 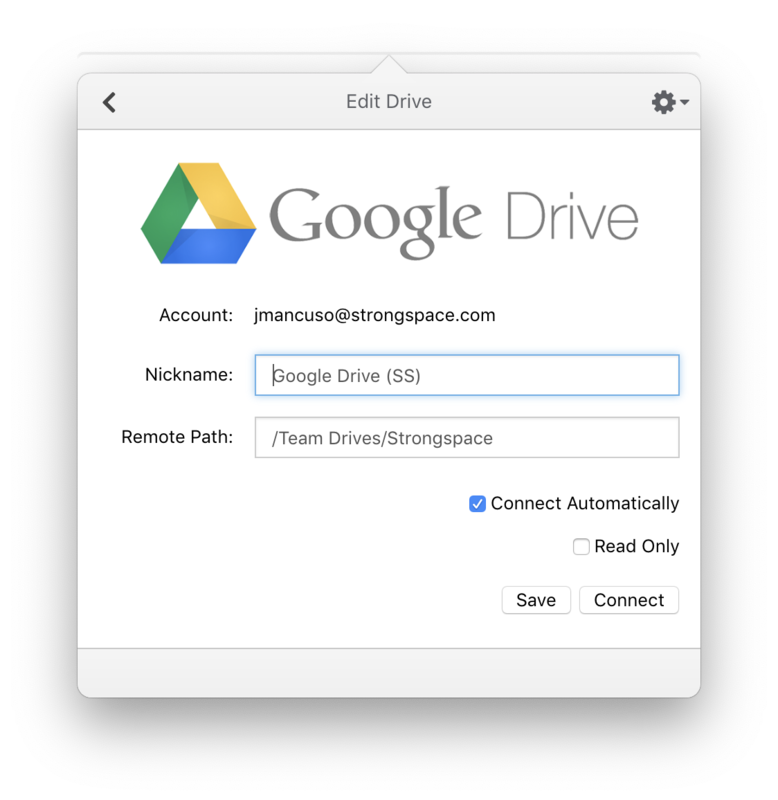 You can map the root of your Google Drive or an individual Team Drive as a drive letter. 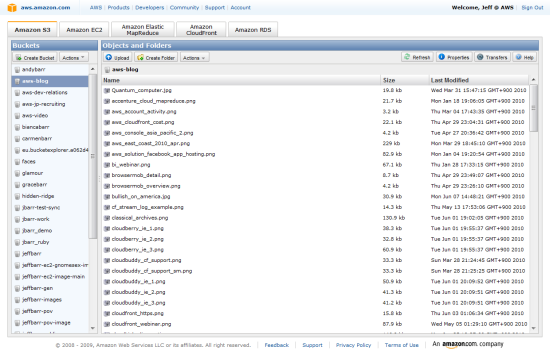 You can even configure ExpanDrive to mount individual folders within your personal drive or within a Team Drive. If you’re working on a project confined to one tree of folders, this can be really convenient. Let’s say you’re working on a team of people that is all using the same Team Drive. You can map that team drive to its own drive letter by configuring the remote path inside ExpanDrive. All of the team drives are organized in the “Team Drives” folder. If you had a Team Drive named “work” you could mount just that by setting the remote path to “/Team Drives/work” inside ExpanDrive. Saving disk space or accessing huge shared Google Drive accounts is another great thing about ExpanDrive and Google Drive. Everything is accessed on demand without preemptively syncing data back and forth. So if you were working on a huge Team Drive like in the previous example you could mount that entire space without needing to first sync it to your computer. You can also easily mark files to be available as offline so you can get work done even without an internet connection. ExpanDrive lets you actually mount your Google Drive account as a virtual drive, just like a USB Drive, on Mac or Windows. 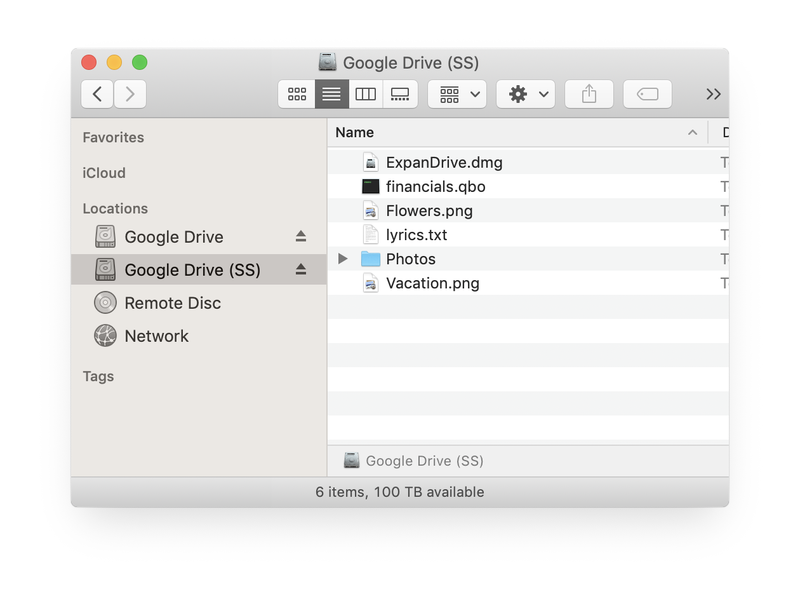 It adds Google Drive to Finder so you can browse and access your Drive account without needing to first sync your files, which takes up time and space on your laptop. Just access what you need, when you need it, from within any app like Finder, Windows Explorer, Microsoft Word, Photoshop, or whatever you use. Everything is safely in the cloud but not taking up space on your computer. Isn’t that the point of cloud storage anyways? What good is a 10TB account if your only supported mechanism move data is via sync. Jason Snell recently wrote a piece at Six Colors called the Dropbox Terabyte Conundrum about this same problem with Dropbox’s new 1TB plan. Using Sync to move your data means you need to pick a folder that mirrors your Drive account and then keep a copy of all that data on your machine. So unless your laptop have a 10TB Drobo or Synology NAS attached to it, then you can’t really DO much with a 10TB Google Drive account. Unless you have ExpanDrive. ExpanDrive let you connect Two or Multiple OneDrive accounts at the same time on any Mac or Windows PC. Microsoft’s office OneDrive client and the Windows built-in client are only able to connect to a single OneDrive or Sharepoint account. This makes sense for most people. If you want to connect to multiple accounts at the same time ExpanDrive for Mac and Windows is an amazing option. You can access your content on demand without needing to sync anything. It’s not uncommon for people to have a OneDrive for Business account for work or school and also have a personal OneDrive account on their own. With multiple accounts your only option to move data in and out of both of those is using the browser. This might be fine for occasional use, but any serious user relies on native access to their files. Having on demand access from Finder or Explorer is essential. ExpanDrive v6.3 is out via the auto-updater and on our main download page. It supports macOS 10.9 and newer and Windows 7 through Windows 10. This release improves SFTP support with better background reconnect login as well as remote refresh. It also adds support for Backblaze B2 API keys and adds support for mojave dark mode. ExpanDrive v6.1.15 is out which adds an updated icon overlay shell extension for Windows that fixes an issue on some systems where ephemeral TCP ports could become temporarily exhausted. The shell extension is also a good bit faster and should improve the speed of browsing in Explorer. You can get this update from our download page or via the auto-updater. Detailed release notes are available on our support page. Box.com, like most big online storage providers, provides a Sync client for your desktop PC or Mac. The Box sync client has long been plagued with problems and has had a reputation of being notoriously slow and buggy. Especially on the Mac. Box Sync 4 improves things a bit, but it still has the same problems any syncing app has. The best solution is to Map or Mount Box as a Network Drive, with ExpanDrive. Connect to your Box account just like a USB Drive. Browse the account in any application, like Word, Powerpoint, Photoshop – whatever. View and managed all your files directly from within Finder on the Mac or Explorer. 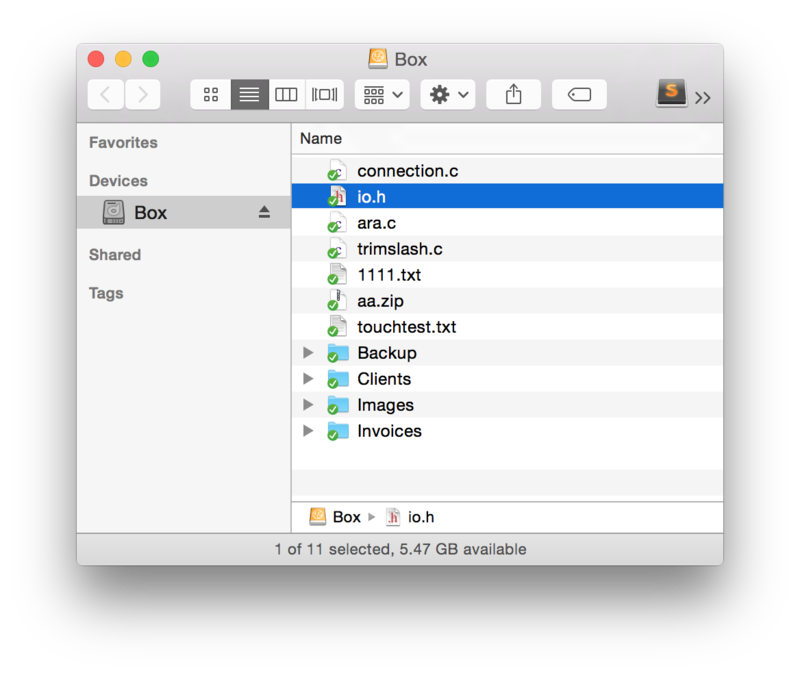 To use Box Sync you first have to download all the data to your machine – which takes a long time and can take a lot of storage. If you’re running a MacBook Air or an notebook with a 128GB SSD it’s going to pretty hard to use your company’s 500GB Box account. Forget trying to store lots of media and assets with Box sync. What you really want is to offload that data to the cloud, but still be able to get at it when you need it. That’s what a network drive like ExpanDrive is perfect for. The files are still there, but they are just stored directly on Box. Box has a great security model – you can provide fine grained control to your users. When employees leave, you can simply revoke their permissions. However, using Box Sync that model breaks down a bit. Everybody has a copy of the data sitting on their laptop. If the machine is lost or stolen the files remain there for the taking. If an employee runs off, they can still access all the data they had before since it is just sitting in a folder on their computer. ExpanDrive makes managing your Box account as seamless as using a USB Drive. It also improves the Box security model – ExpanDrive accesses everything on demand. Here is a video to help get a better idea of what ExpanDrive does and how it works. Amazon Drive is Amazon’s consumer oriented file sharing and backup option. It’s not the same as S3, which is part of their cloud computing platform. While Amazon does have sync clients available, ExpanDrive is a special type Amazon Drive client that runs as a mountable network drive on macOS or Windows. ExpanDrive lets you map Amazon Drive as a fast network drive Windows 7 through Windows 10 as well as Windows server and macOS 10.9 and newer. ExpanDrive lets you map Amazon Drive as a network shared drive on Mac or Windows. You can browse and access your account without needing to first sync your files, which takes up time and space on your laptop. Just access what you need, when you need it, from within any app like Finder, Windows Explorer, Microsoft Word, Photoshop, or whatever you use. Everything is safely in the cloud but not taking up space on your computer. Isn’t that the point of cloud storage anyways? ExpanDrive v6.1.13 is out fixing a variety of small issues and improving overall performance and stability. You can get this update from our download page or via the auto-updater. Detailed release notes are available on our support page.